It it did again: the Supermoon made a superb show on the 20/21 Mar. 2019 night, when we were just crossing the Vernal Equinox. Once again, it was a tremendous opportunity to invite people to stay outdoor and look up, enjoying the Moon and discovering there something unique up there: the starry sky. As strange as it may sound, many people are missing a unique beauty. Something lurking up in the sky, at night, bringing us a sense of vastness and a trill of eternity. It is the starry sky. Unfortunately many of us live in huge cities or urban areas with so much artificial light that it is impossible to even see a fistful of stars. This contamination is called “light pollution” and it is something we should contrast for what it is: a form of pollution and a huge waste of resources and money. 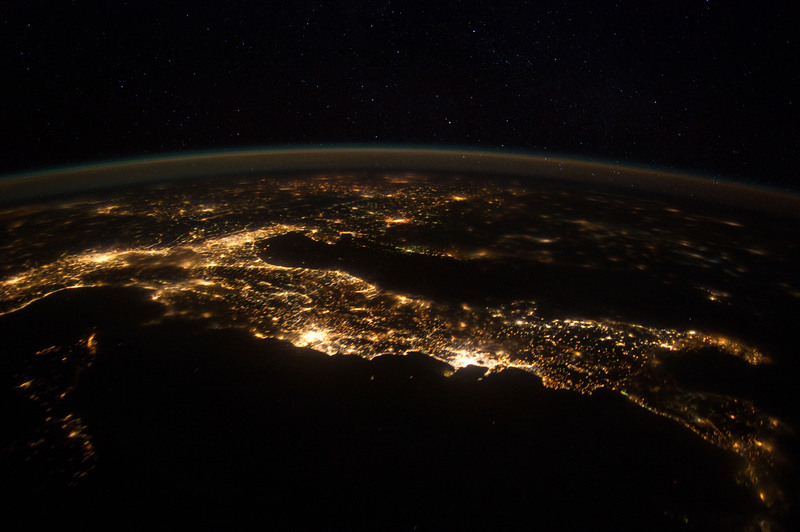 Everyone should take care of the firmament and its immense, ancient cultural value, keeping it for future generations. During my outreach activities to increase awareness about light pollution, I have understood that one of the main obstacles to overcome is exactly this: those living in a city do not see the stars, so they really do not realize there is such a huge, beautiful and precious heritage – the starry sky – on the brink of extinction.This makes much harder to raise people awareness about the light pollution issue. This is why I’m never tired to invite people to look for the stars from their cities. Doing this, they see how rewarding this experience is and they desire to enjoy the night sky more and better. At this point, they understand what they can do to succeed. It becomes possible to involve them and spontaneously promote responsible actions and behaviors, preserving the upper side of the natural scenery, useful to limit the crazy increase of artificial light in the natural environment. Promoting and sharing the beauty of the night sky is the best action to preserve it. This is why I welcome every astronomical event accessible for the city. 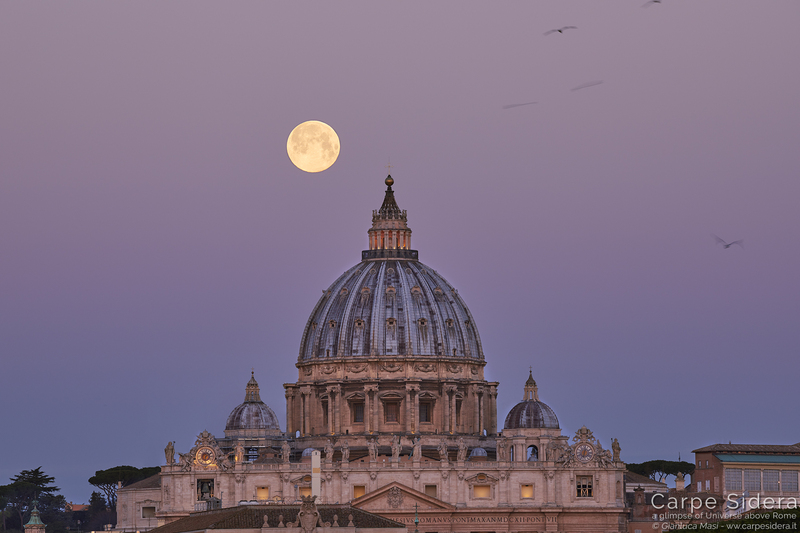 And, of course, the Supermoon is perhaps one of the most popular ones! This year, we had the full Supermoons in a row: one in January, when we also had a total lunar eclipse; one in February, the largest full Moon of the year, and one in March, happening within a few hours from the Vernal Equinox, marking the beginning of Spring for us living in the Northern hemisphere. Something happening not so often: lat time it was in 2000, next time will be in 2030, but neither of them was/will be a Equinox Supermoon. This added a lot to the feelings. 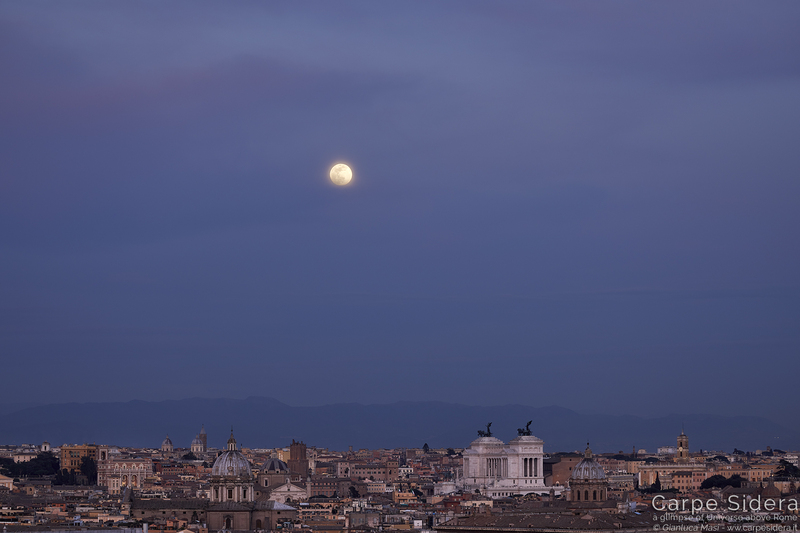 I planned a live streaming to share the Vernal Equiniox Supermoon from Rome at sunset, while it was rising above the unique skyline of Rome, with its legendary monuments. Past experience with this proved to be extremely successful. Seeing the full Moon at sunset is for me very special. By definition, our satellite rises on the opposite direction when the Sun sets and you can see it as soon at it pops above the horizon, while all around the twilight makes the environment well enjoyable. I planned everything with care, of course hoping in clear skies. 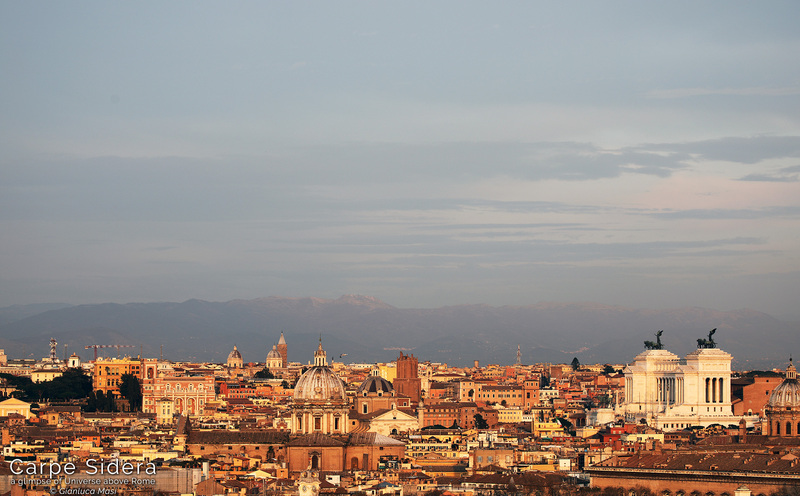 I selected a place on the Janiculum hill, having a wonderful sight on the East, where we had to look for the rising Moon. I arrived there 30 minutes in advance, to be sure to be ready to start the live streaming on time. I had with me one of my Canon 5D mark IV DLSR bodies, with a Canon EF 100-400mm f/4.5-5.6L IS II USM lens, both hosted by a sturdy tripod. The camera was connected to my laptop and and portable 4G modem provided the internet connection. The weather, cloudy for most of the day, was rapidly improving and by the time I had to start it was almost clear, with the only surviving clouds… exactly where I did NOT want them: East! Thanks, Mr. Murphy. Despite the clouds, I decided to start the live feed, being confident the Moon was going to show sometime soon. 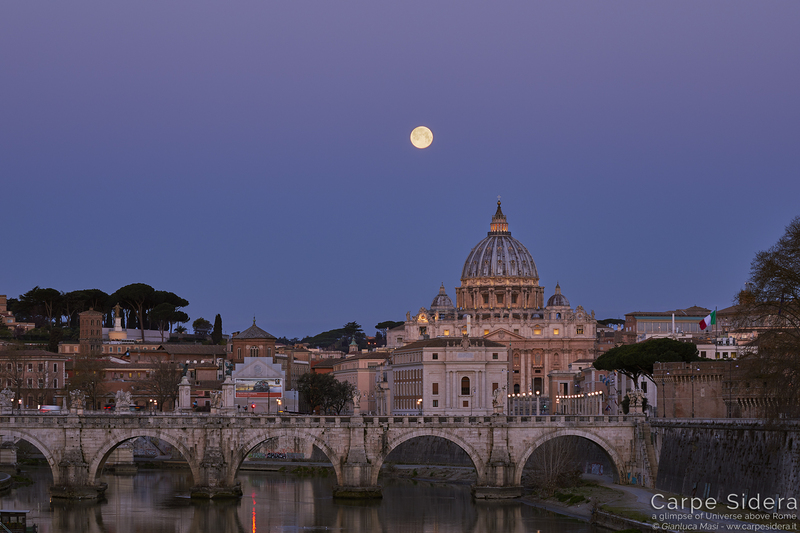 It took 40 minutes or so to see a glimpse of the Equinox Supermoon and at that time the satellite was relatively high above Rome and the night was quickly coming. The Supermoon finally showed in the evening evening, while the twilight was quickly fading. The live streaming was an amazing success, with more than 80,000 individuals joining it from all around the planet. At the end o f this post, please find the recorded live streaming. Of course, I already decided to wake up very early in the morning, to grab the Supermoon when it was leaving, setting at dawn. This also because weather forecasts was quite optimistic for the morning. 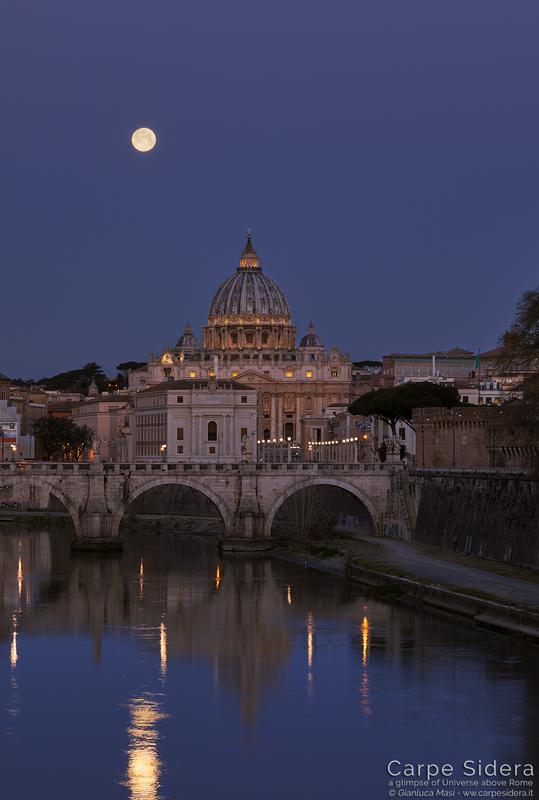 Of course, I did calculate a few things to find the right place from where the Moon could be seen together with something special from Rome. 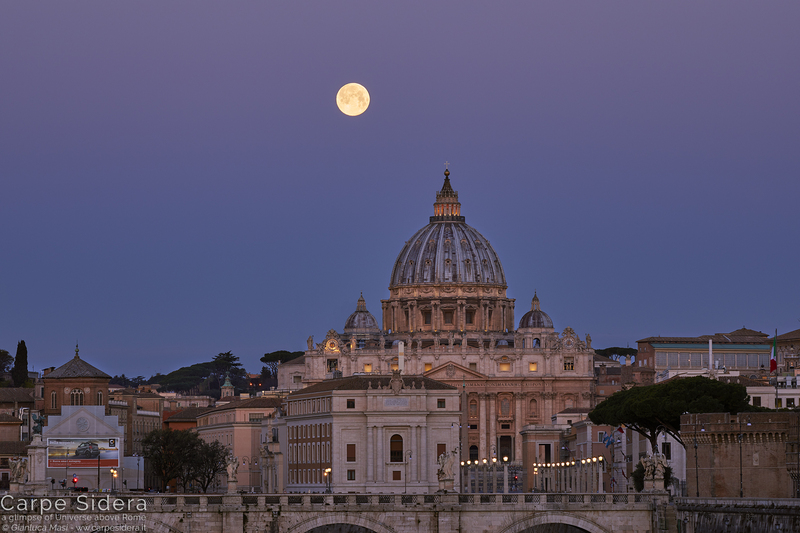 I selected the legendary St. Peter’s Dome as the monument I wanted and, from there, I managed to find from where I could see the Moon passing behind the lantern of the mentioned dome. 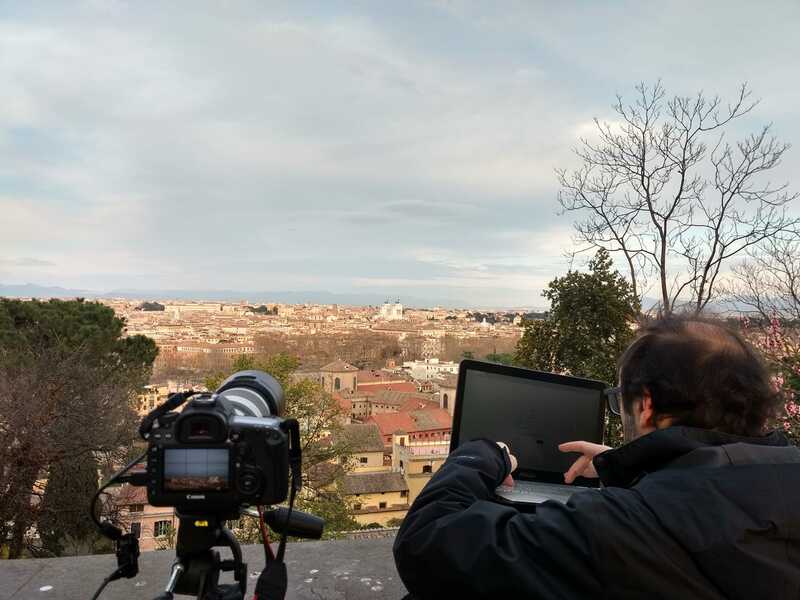 It happened to be a place close to Castel Sant’Angelo, which I reached very early in the morning, to have enough time to properly setup my imaging gear. It resulted to be a nice choice. Minute after minute, our satellite got lower and lower, while the sky lit. It was a continuously evolving scenario, one of the best sight I had recently, with the Tiber river being part of the scenery. 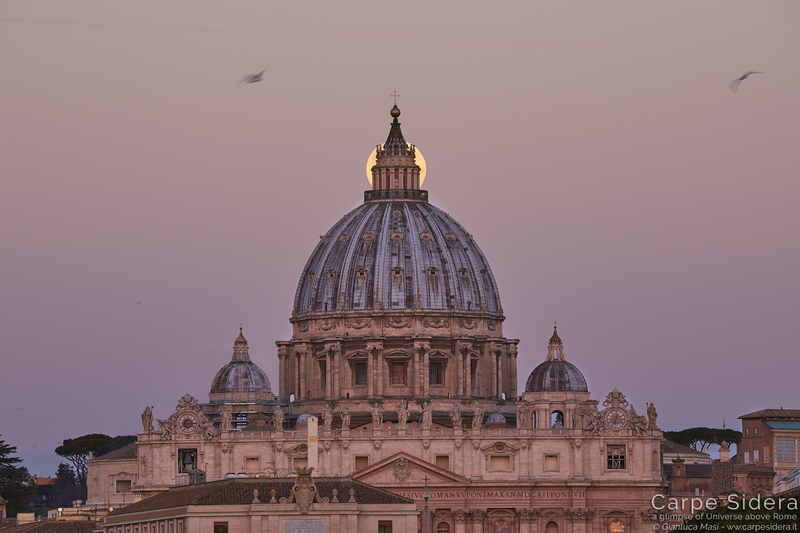 Behind the Basilica, the so-called “Venus belt” was well visible, as an horizontal band with its typical pink hue. This always fascinating feature is due to the shadow that the Earth casts to its atmosphere: at dawn, it seems to fall down like a curtain, as sunset approaches. It is incredible to note how fast the Moon seems to move once you have a terrestrial reference element in the foreground. While approaching St. Peter’s Dome, I could almost note this apparent motion in real time: how many rhythms are at work all around, if you just look! Seeing the Moon passing just behind the dome’s lantern was super. I caught this already in the past, from a different place (from where the Dome was farthest and the lantern consequently “smaller” compared to the Moon), I was so happy to see it again. 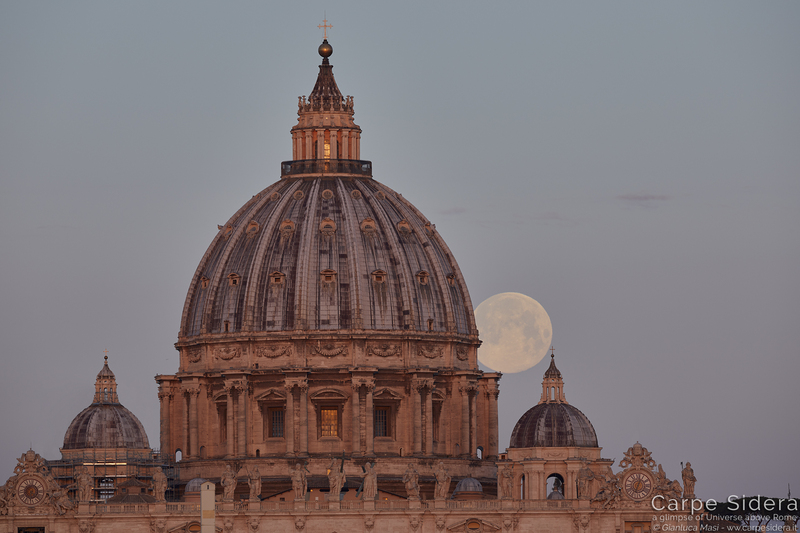 The Supermoon hides behind St. Peter’s dome lantern, at last. In a few minutes, the Supermoon was in between the big dome and one of the smaller ones, something I had been waiting for a few weeks. Meantime, the Sun rose and its light dressed the stunning Basilica with a unique color. Well, I must admit it was hard to say goodbye to this unique show. You can see something like this hundreds of times, but once done, you are already checking when you can redo it. In the light of the considerations at the beginning, I included this event as part of the “Dark Skies for All” program by the International Astronomical Union, proudly being an Ambassador of the project itself. Be ready: the next cosmic journey is coming soon!